Brisbane - South Africa will be seeking a replacement for batsman JP Duminy after he was ruled out for the rest of their three-Test series with Australia with a tour-ending injury, coach Gary Kirsten said on Saturday. Duminy suffered an Achilles tendon injury while warming down kicking a rugby ball after the end of play at the Gabba on Friday. The batsman, who was a star of South Africa's historic 2-1 series victory in Australia four years ago, went for hospital scans after being helped off the ground and will undergo surgery on Saturday, team officials said. 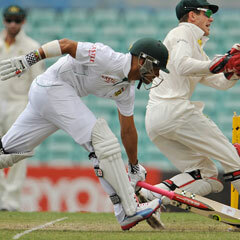 Kirsten said Duminy's injury was a "very unfortunate" mishap. "He just ran for some training runs which is a standard thing we do with the team and it was literally as benign as making a turn on a run and he snapped his Achilles," Kirsten told the Australian Broadcasting Corporation. "He will be out for about six months. It's been tough for him and the team, but we've just got to step up now." Kirsten said a replacement from South Africa would be summoned, but as yet he was unsure of who would come to Australia for the remainder of the three-Test series. Team manager Mohammed Moosajee said Duminy would have an operation in Brisbane on Saturday. "The diagnosis of an Achilles tendon rupture was confirmed by the MRI scan and he will undergo surgery to re-attach the tendon on Saturday morning," Moosajee said. "He is obviously disappointed, but JP, being JP, is trying his best to stay positive, he says everything happens for a reason." Duminy's loss poses an immediate problem for the Proteas, who went into the first Brisbane Test without a recognised spinner after preferring seamer Rory Kleinveldt to leg-spinner Imran Tahir in an all-pace attack. Duminy's off-breaks would have come in handy to add balance to the South African bowling attack, which will be spearheaded by Dale Steyn, Vernon Philander, Jacques Kallis and Kleinveldt.